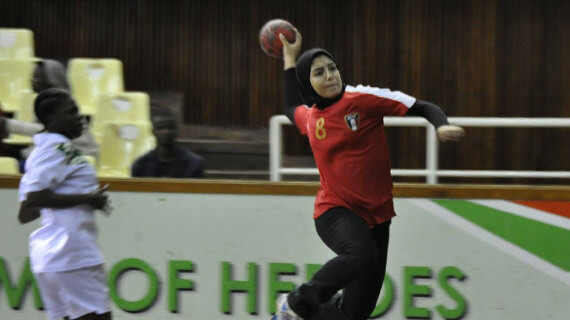 Inexperience cost the Kenya U-20 women handball team their match against a well-oiled Egyptian side that pulled a 43:18 upset at the Safaricom Indoor Arena during the ongoing 11 edition of the African Women Youth Championship on Saturday. The well drilled Egyptian side took control of the match in the first ten minutes doubling their lead in the 12th minute to shrug off the stubborn Nairobi Water Mitchelle Atieno as they led Kenya 9-4. With Kenya’s lethal attacker neutralized, Victor Siero’s girls found it difficult to break down the Egyptian defense to end the first half trailing 9-24. Capitalizing on first breaks, Kenya’s unconverted high turn overs and unforced errors in the second half was a different script for Kenya as the Egyptians upped their tempo making the Kenyan girls commit more unnecessary fouls. Kenya played with a player less for 20 minutes of the match duration as they committed several two minute penalty fouls most of which were in the second half eventually costing the team the services of Morena Akinye Mjuka, Rehema Mwajuma Situma and Jane Waithera who received their marching orders after receiving a third 2 minute penalties resulting into automatic red cards. The Match ended 18:43 in favor of the Egyptians.